Both of the 1990s "Mortal Kombat" movies! Awesome deal! Mortal Kombat (1995): It's really something for me to like this movie, because I hate, hate, HATE the video games! 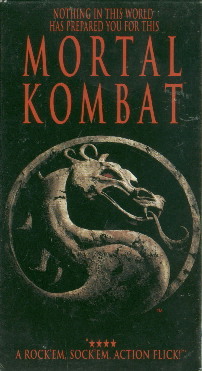 When the first Mortal Kombat video game came out in 1992, it become the archetype for the "sick" video game that needed parental advisories and, ultimately, an age rating. Up until then, all commercial video games were made for pretty much any age group. The "Mortal Kombat" video games had incredible gore and acts of violence. That's why I was surprised when I found out this movie had NONE of that. The film of "Mortal Kombat" was made as more of a family film, with a PG-13 rating. Very mild violence. And, to top it all of, the movie made up for the lack of graphic violence with a really great story and good acting. Maybe that's why it didn't take. Had it been a mindless blood and guts flick, it probably would have been HUGE. Go figure! The "Mortal Kombat" games never striked me as having superhero overtones. The live-action shows, however, are VERY superhero. It's good versus evil, exotic heroes and villains, fantasy and sci-fi elements...all the ingredients of a legitimate superhero show. This first movie is good. The second? Okay, but kind of dumb and nowhere near as polished as the first film. The following TV series was a prequel to what happened in these two movies. My question: Why bother?